Rain showers this evening with mostly cloudy conditions overnight. Low near 40F. Winds light and variable. Chance of rain 90%.. Rain showers this evening with mostly cloudy conditions overnight. Low near 40F. Winds light and variable. Chance of rain 90%. The Poca boys are shown with their championship trophy from the UKV YMCA Holiday Tournament in Montgomery. To purchase some tournament photos, see www.valleysportspics.com. The Sherman girls are pictured with the championship trophy from the UKV YMCA Holiday Tournament. Valley claimed runner-up status in the boys tournament. The Riverside girls were tourney runners-up. Riverside's Jasmine Symns goes up strong against Sherman defenders Saturday. Symns netted 21 points against the Tide. Quinten DeMello shoots a baseline jumper for the Greyhound boys. Poca's Tanner Miller attempts to halt Valley's Lucca Giannini on a drive to the basket. Tori Martin scored 15 points for the Warrior girls Saturday. Valley's Jimmy Harper works against Poca's Bronson Skeens. Alyssa Burns makes a move in the interior for Riverside. Sherman's Dejah Busby led her team with 20 points. 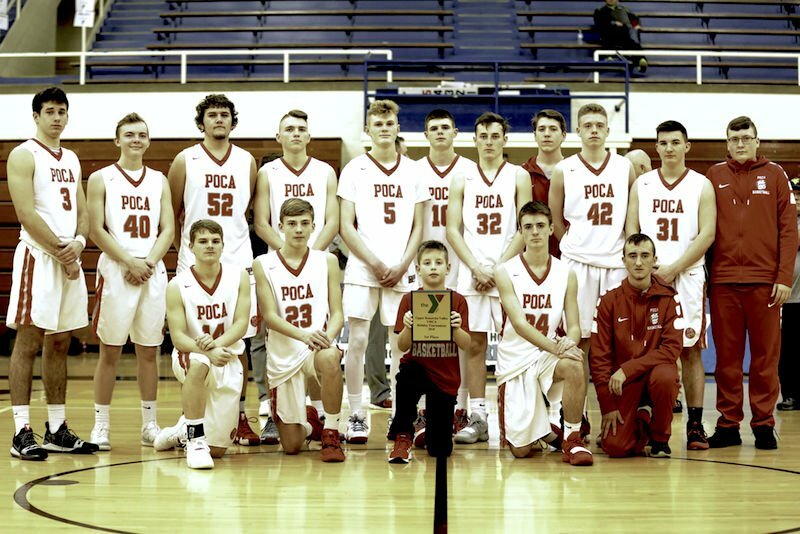 Poca rallied from an early seven-point deficit to forge a 51-37 victory over Valley to capture the boys title Saturday, and Sherman took command in the final quarter to gain a 57-49 victory over Riverside for girls bragging rights. The Greyhound boys raced to a 6-0 lead on the strength of a Lucca Giannini deuce, single free throws from Giannini and Adam Falbo and a tough baseline connection from Quinten DeMello. The Greyhound margin later reached seven points, 11-4, on another goal from Giannini off a Poca turnover, but the Dots settled down after that and trimmed the deficit to three, 12-9, by quarter's end. With Valley leading 17-16 at about the 5:30 mark of the second quarter, Poca got a big lift from Evan McKneely to go into the lead. McKneely buried a trio of 3-point goals in a span of 1:41 to cap a 12-0 spurt that gave the Dots a 25-17 advantage and, more importantly, the momentum. A Zach Winter 3-pointer allowed Valley to temporarily stop the bleeding, but Poca carried a 29-20 lead into the locker room at halftime. A 7-0 Poca run, including another McKneely trifecta and a two-handed dunk from him, pushed the lead to 14, 36-22, a little more than midway through the third frame, and the 'Hounds unsuccessfully played catch-up the rest of the way. For Poca (4-2), which defeated Valley 65-41 in the season opener, Evan McKneely and Isaac McKneely both scored 17 points. Falbo netted 14, Giannini 12 and DeMello eight for Valley (3-4). Sherman pulled away down the stretch to secure the girls championship Saturday with a 57-49 victory over Riverside. 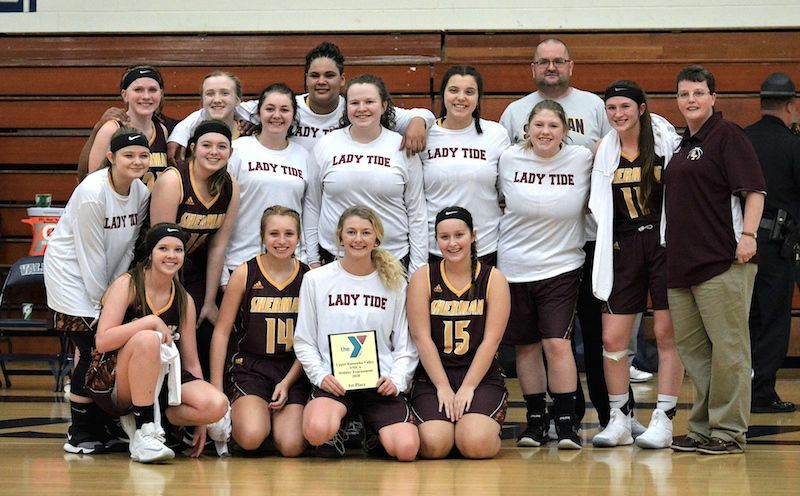 Ahead 48-45, the Tide got stickbacks from Cassie Keith and Amber Maloskey to grab a 52-45 lead, then three foul shots stretched the lead to 10, 55-45. Dejah Busby tallied 20 points to pace Sherman. Maloskey and Keith added 10 apiece. Jasmine Symns bucketed 21 and Tori Martin scored 15 for the Warriors. In the girls consolation game, Independence outpointed Valley by 10 points in the second half to nail down a 52-41 verdict. Alexis Bolen poured in 31 points for the Patriots, and teammate Madison Deck tallied 15. For the Greyhounds, Hannah Foster tallied 17 points. Riverside downed Van 72-69 to earn third place in the boys division. For Riverside, which got its first win of the campaign, Javonte' Elzy compiled 23 points, nine assists and six rebounds to lead the way. Brian Massey added 16 points, and Jeremiah Mason logged 10 points, 11 boards and three blocked shots. Van got 20 points from Caleb Price, and Gavin Smith tossed in 19 points.